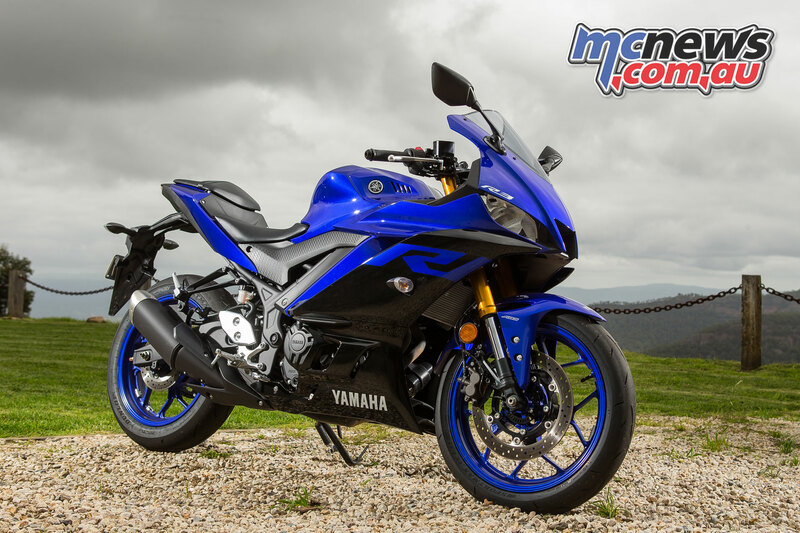 Learner riders have never before had such a great range of machinery to choose from, and with Yamaha giving their very popular YZF-R3 model a comprehensive update for 2019, things have hotted up even more in this important sector of the market. 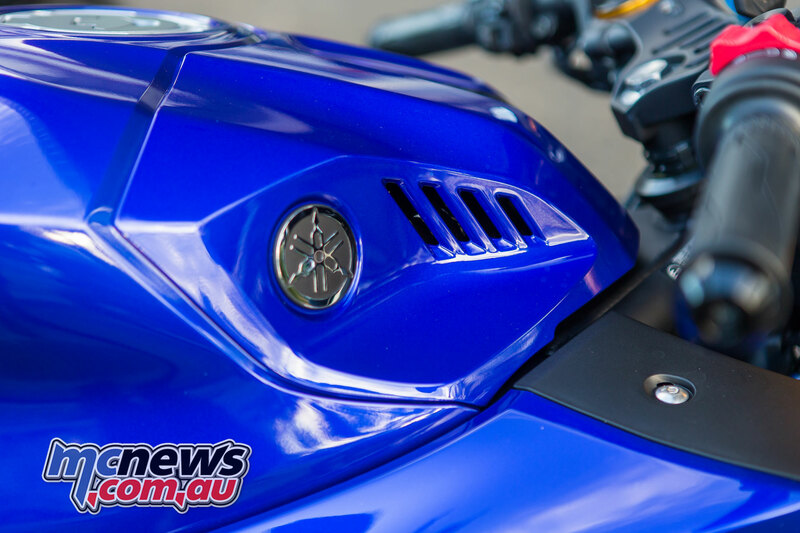 Kris Hodgson went along to the Australian launch of Yamaha’s new LAMS legal sports machine and reports back here his findings for MCNews.com.au. 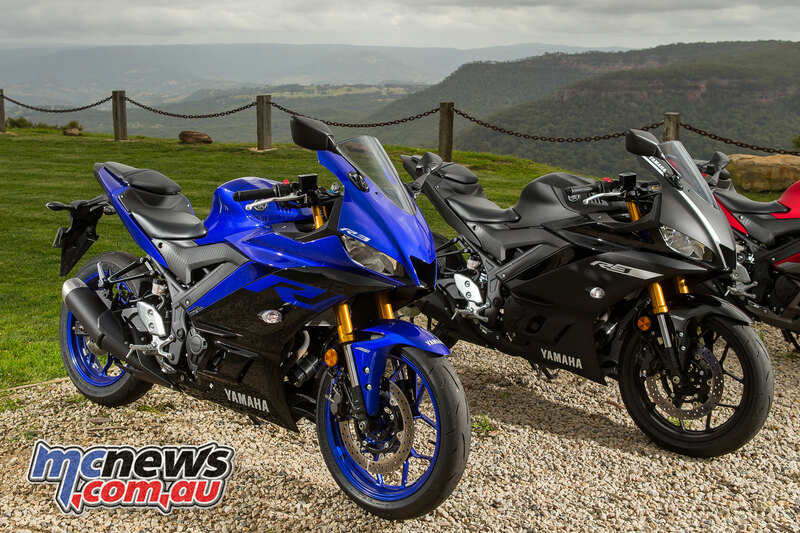 Yamaha has recently updated the R series DNA across both their YZF-R1 and YZF-R6 Supersports machines. In normal jargon that means they’ve updated the styling on these two iconic machines – along with a host of other changes. Looks are always a heavily subjective area but the styling updates have certainly given both a unique profile that stands out from the crowd. 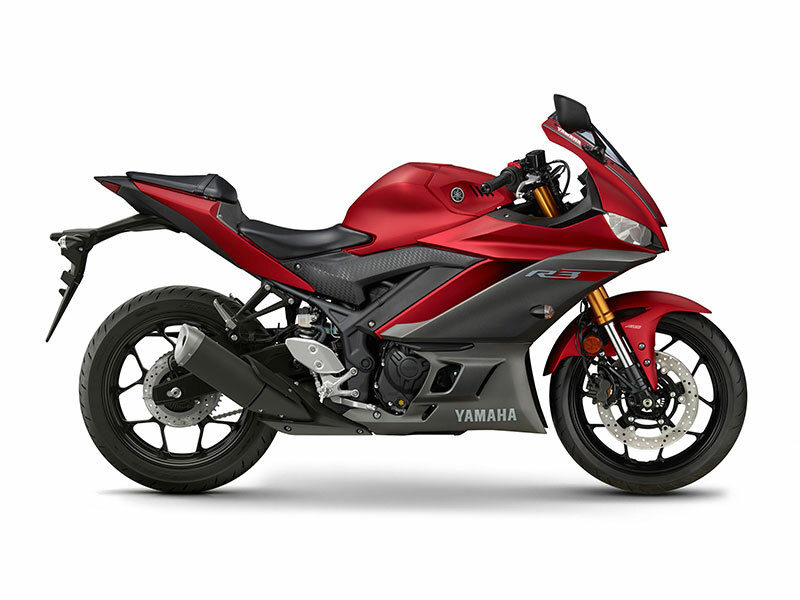 Now the YZF-R3 gets the same treatment, and while never a machine that could be accused of skimping on style, the update brings the best-selling beginner option closer to the fold, ensuring a clearer than ever connection to Yamaha’s signature sports styling across the range. Some might question that racing connection, however the YZF-R3 is undoubtedly a ‘racer rep’. 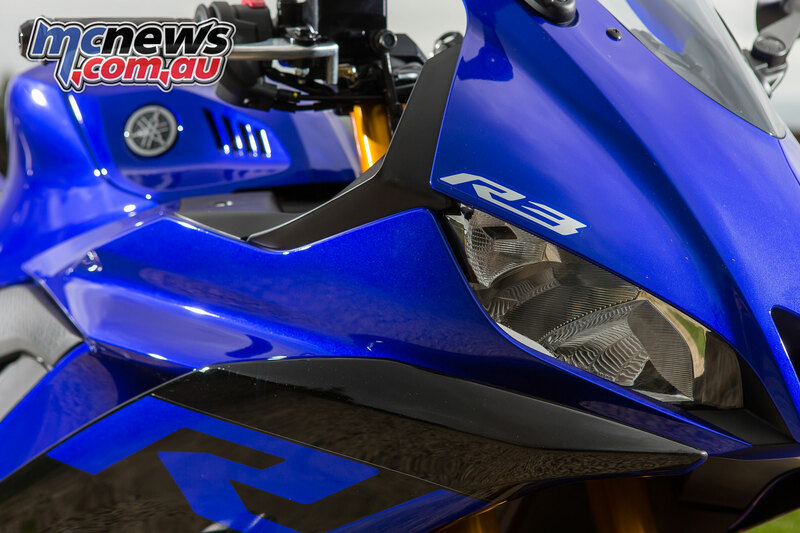 A large part of the R3s appeal stemming from it being a proper sportsbike, if one that sits within the LAMS restrictions here in Australia, as well as the 35kW restrictions over in Europe. 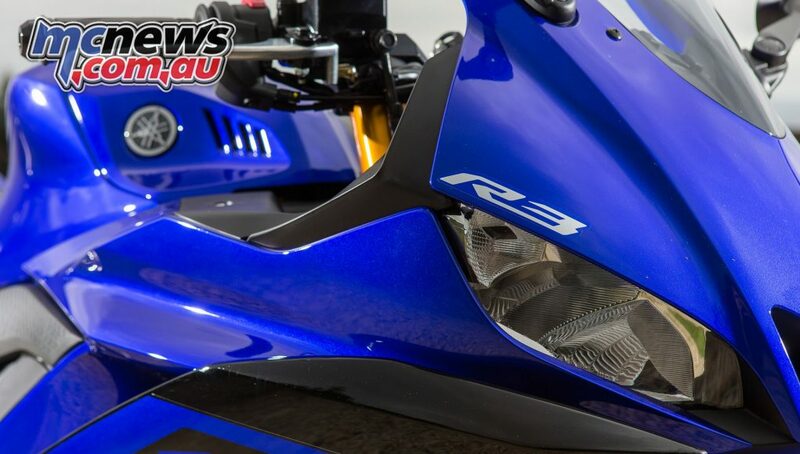 That’s another boon for the R3, it’s been designed specifically for the category. There’s no crude restrictions bringing this motorcycle down to acceptable learner levels, and that’s something imminently obvious once on board. It does not feel as though it is on an artifical leash, but is a willing performer that gives its all. 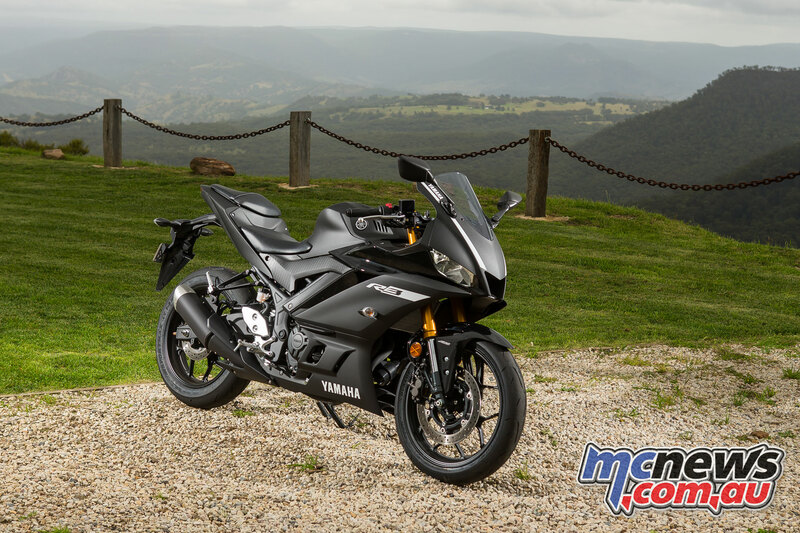 The 2019 Yamaha YZF-R3 isn’t just new looks, the fairings and stylish central air intake contribute to a higher top speed, with claims of +8km/h floating around for a top whack north of 180 km/h. The tank has been redesigned and now sits lower, but is actually wider across the top of the tank in the section which sits above your knees when riding. Fuel capacity remains unchanged, so there’s no worries there for the commuters, and the 780mm seat height remains as manageable as ever. The other area for big updates is on the front end, where new 37mm USD KYB forks are featured. 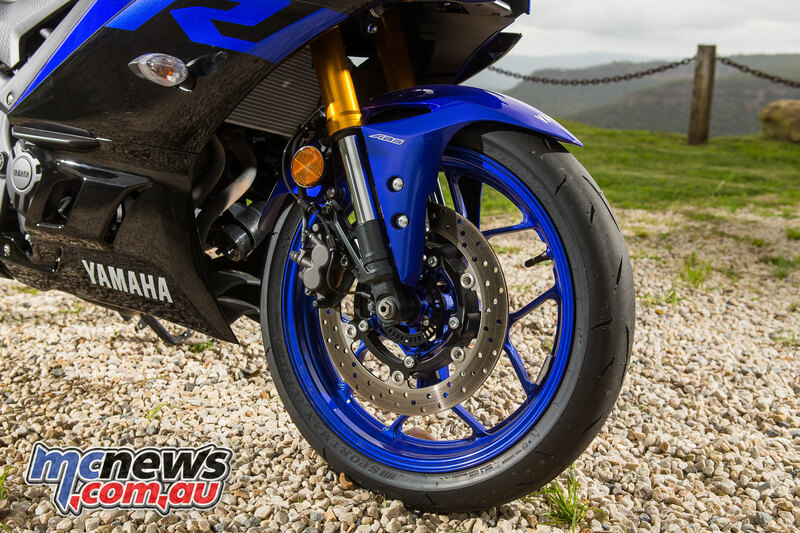 Yamaha promises a sportier ride and the gold forks really give the bike that racer look from a distance. These new forks will take an Ohlins cartridge kit, unlike the previous iteration, which is a purposeful boon for the racers out there. 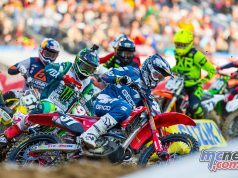 The shock has also been updated with a stiffer spring rate and preload is the only adjustment that a rider can fettle. 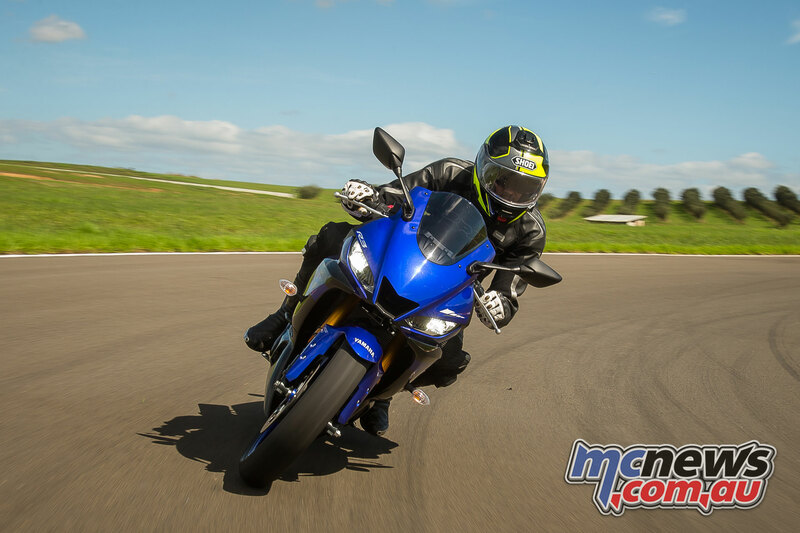 The combination of the two is a bike that really feels like a sportsbike, where the previous model I tested definitely had a more road orientated edge, and a softer overall ride. 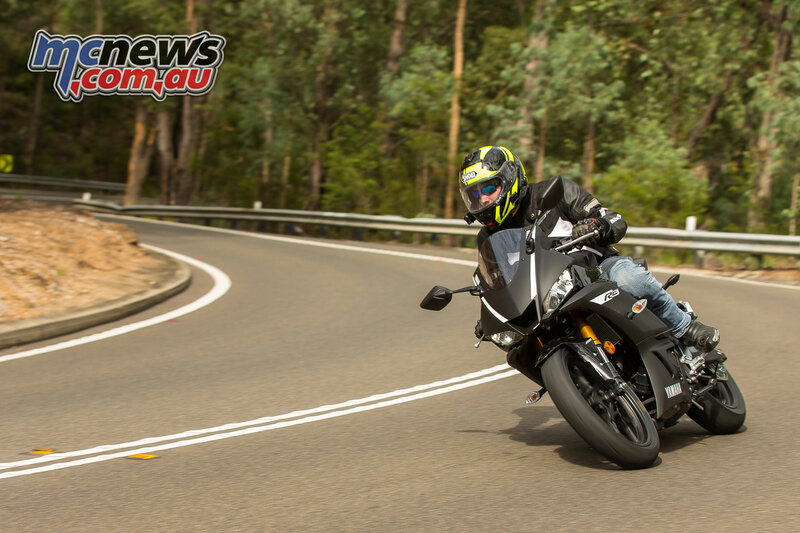 Both generations offer a capable corner carver, but the commuter aspect won’t be intruding on chasing your mates through the twisties on the 2019. The triple clamps have also been updated to suit the new KYB forks, featuring cut-outs that mimic the look of that found on the R1, keeping weight down and looking the business. 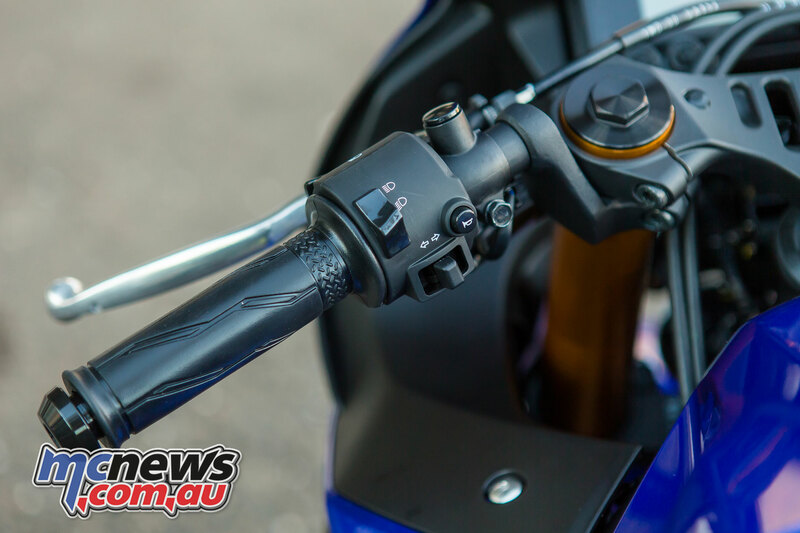 The other point of note is that the raised clip-on style ‘bars are now 22mm lower, positioning the rider in a more sporting stance. Those lower ‘bars still don’t give the full sportsbike clip-on feel, which is normally accompanied with lacking steering lock and a very committed crouch. However combined with the changes to the tank, there’s certainly more room to tuck in on the little racer, especially for the bigger framed riders out there, which ensures that the racer crouch isn’t mandatory, but it’s very possible. The overall seating position is still fairly upright, offering a commanding view of the road ahead, as well as a relatively neutral stance on the bike. I found it both relaxing and comfortable, while U-turns remain unintimidating for the inexperienced. 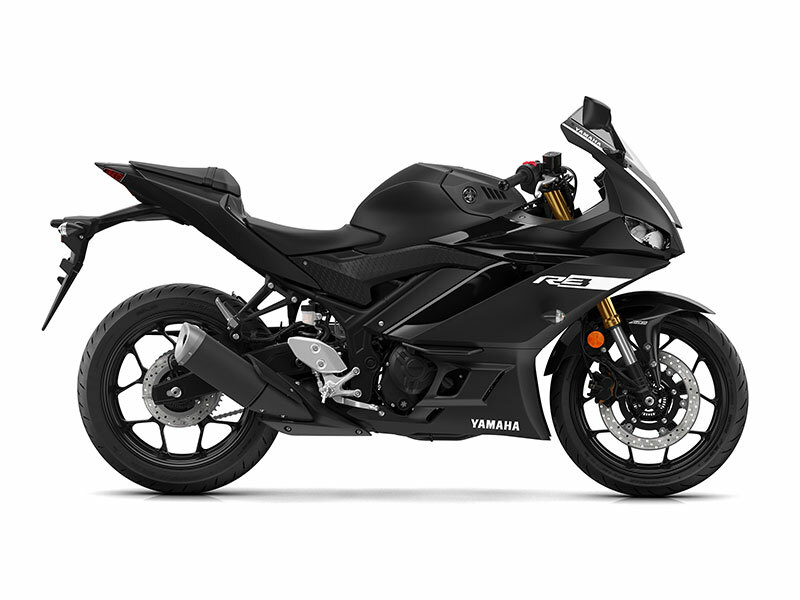 For a bike that looks like a proper sportsbike at a glance, that’s impressive. 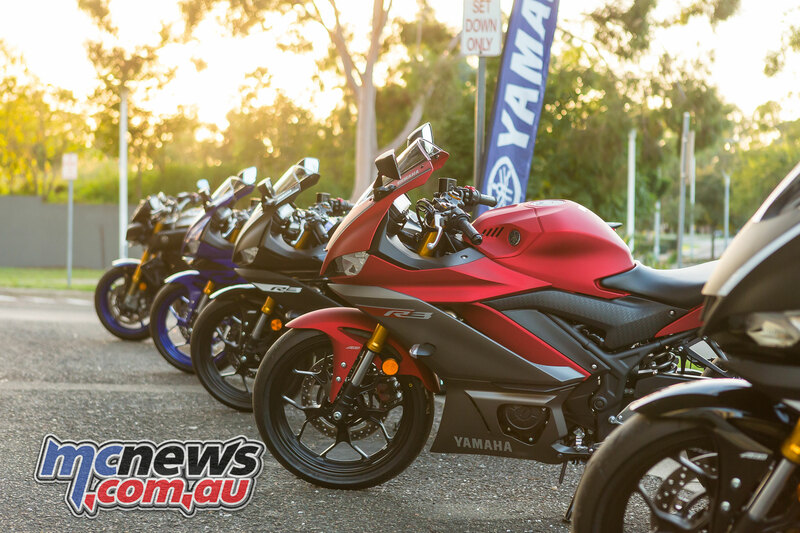 A quick walk around the bikes before we set off for the road ride at the Australian launch reveals three colour options, the traditional Yamaha Blue in gloss, the stealthy Power Black (matte) option, and Candy Satin Red which as the name suggests is also matte. The Red option does take on a pinkish hue at times, but looks awesome in the flesh. The overall build quality is also great for the price, which remains $6,299 RRP + ORC. 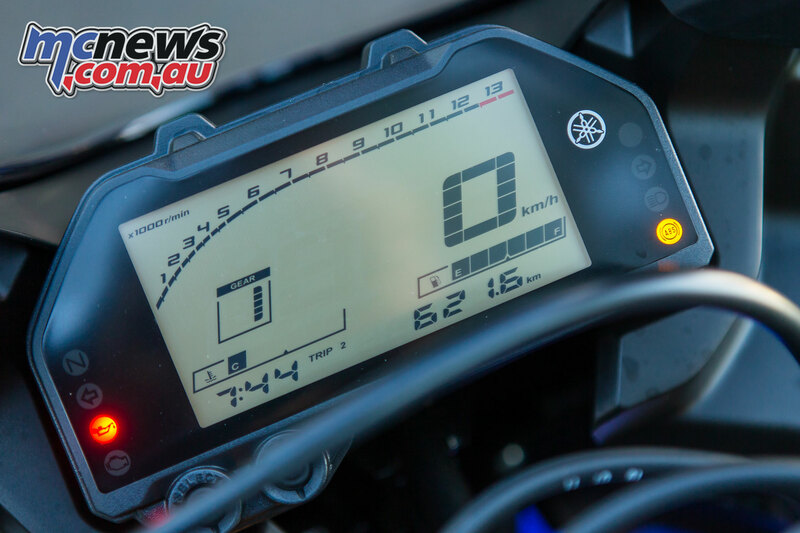 An impressive new high quality LCD dash adds to the quality feel, while only the standard exhaust and foot controls looking a little under-done. Lightweight wheels, clean tails, high quality headlights and sculpted lines on the other hand are all very much in keeping with the R-series DNA. Jumping on board and setting off through Penrith towards better riding roads I was immediately reminded just what a gem this 321cc parallel twin powerplant is. It’s easy to see why Yamaha didn’t feel the need to make a change in this area. The offset cylinder 180-degree crank engine is taut and responsive, and while it doesn’t have the low to mid-range torque of its main larger capacity competitor, there’s no real point of criticism due to it being exceptionally smooth and just begging to be revved hard. Equally, rolling off the throttle reveals exceptional fueling and engine braking, even while aggressively downshifting, despite no slipper clutch. 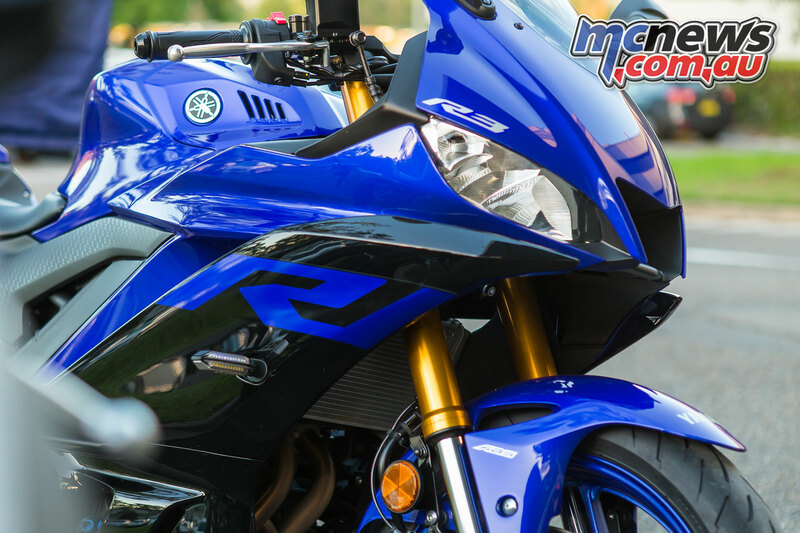 When it’s time to propel yourself to triple-digit speeds, simply open that throttle hard and hold your gears for maximum grin-inducing performance, as the R3 screams into life, with a character that is a fitting tribute to an in-line four-cylinder. In fact the engine is so responsive and smooth that I was really struggling at times to tell what gear I was in purely by feel – although it is clearly displayed on the dash – and you’d really need to be doing something terribly wrong as far as gear selection to end up lugging the engine. I think at one point during photo turn-arounds I absent-mindedly actually took off in third gear. Oops, a shame no one told the R3! That’s a characteristic shared by the overall ride, with the new KYB fork, revised shock and overall ergonomics ensuring a nimble quick steering package, which is light and responsive on the road, as well as remaining stable on the freeway and at high speeds. Freeway and higher speeds also reveals how roomy the R3 feels on the move for my 180cm, 70kg frame, with great protection from the screen combined with an easy and comfortable crouch. 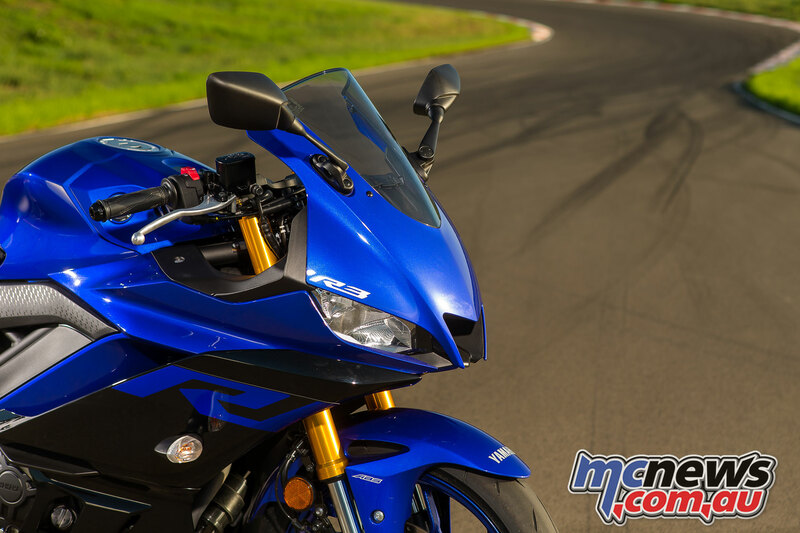 With a noticeably sporty set-up the 2019 YZF-R3 is a joy to ride not only on smooth road surfaces, but also on your run of the mill mediocre roads. Over the really rough stuff that does work against the bike somewhat, especially on the rear, but let’s be honest, this isn’t meant to be a tourer, and that sporty suspension is part and parcel of this kind of machine. 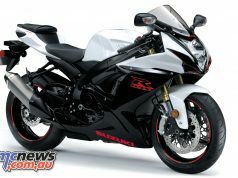 It is an ideal compromise in my opinion as the R3 needs to fill so many roles for a newcomer, as sportsbike, commuter and ideal learning machine, which is no small feat. Through the tighter hairpins the R3 also offered precise and predictable turn in, especially on the brakes, although the machines as tested were all fitted with stickier non-standard Dunlop Alpha 14 rubber in preparation for our sojourn to the track on day two. OEM standard fitment is a more everyday orientated Dunlop Sportmax GPR-300. The front brake was quite light on bite, but with good modulation and eventual power, which combined with the new fork setup allows for rapid deceleration with great control and no excessive dive. 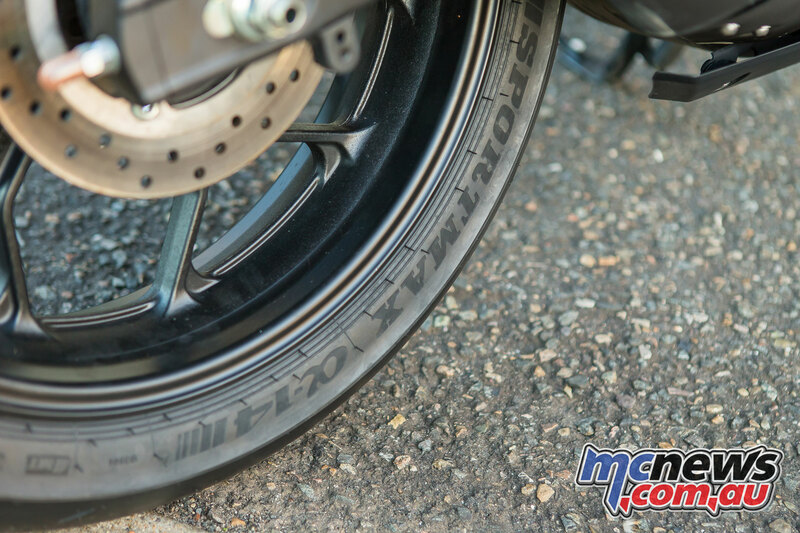 This makes for a stable and predictable braking experience for new riders learning the ropes, especially with ABS backing you up as standard fitment. The great front grip afforded by the sportsbike rubber meant that the front ABS was never triggered but the ABS on the rear could be felt at times through the lever. 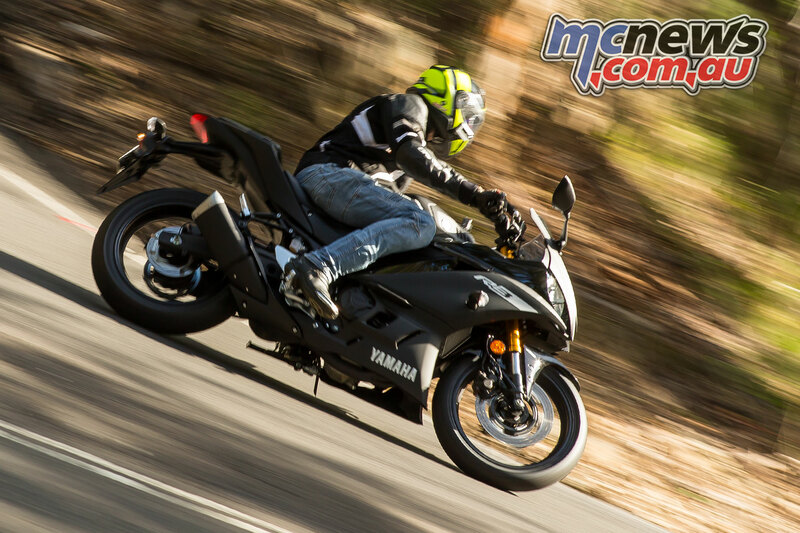 Overall Yamaha’s 2019 R3 is a machine that will handle the daily commute and traffic with ease, boasting an eager and smooth engine that despite being happiest revved hard, will make the everyday slog to work or uni an adventure. 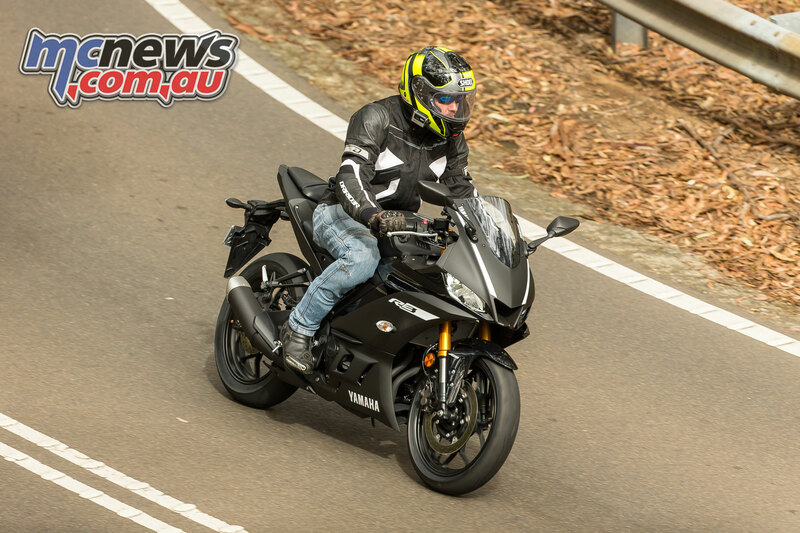 Suspension is by no means plush, however comfort for much of the day in the saddle was good, with the latest R3 only re-establishing the fact that some LAMS machines are good enough to live with as everyday machines, despite relatively limited power. Especially if you’re out to ride hard in the mountains as newer riders there’s still only a limited few bikes that really offer this proper sportsbike experience in the LAMS segment. 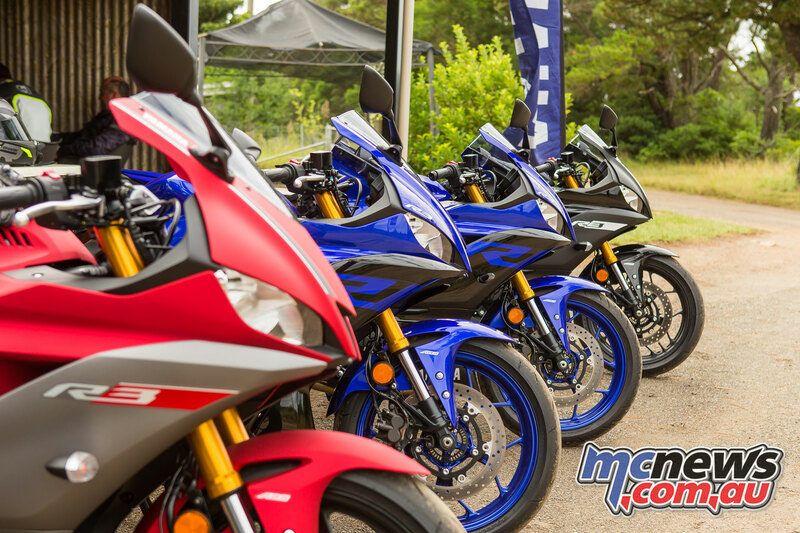 For the modest asking price of $6,299 + ORC the R3 really is exceptional value for new riders. If I had to really try for some criticisms, the lack of adjustable levers comes to mind, along with the aforementioned somewhat crude foot controls and exhaust finish. I have to preface this section by saying I’m no track day guru, or even a fast track day rider. 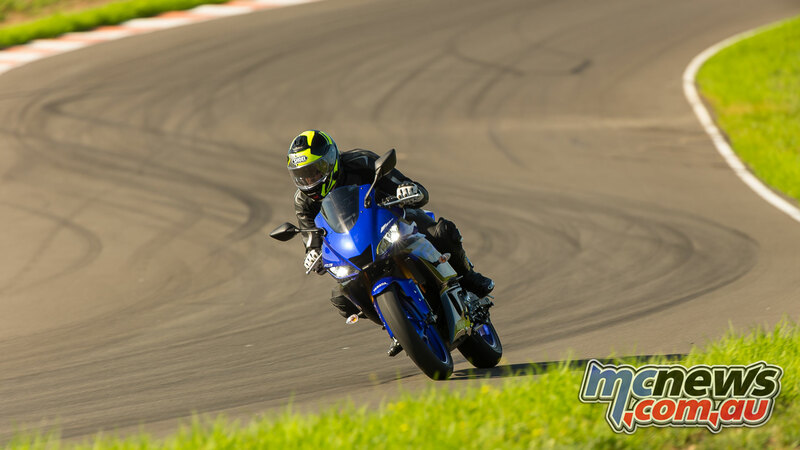 I enjoy heading to the track for the freedom it offers compared to the road, and this is just my thoughts on what the 2019 R3 has to offer riders who’ll be doing their first track days on board this machine, or young riders heading towards advanced rider training courses. 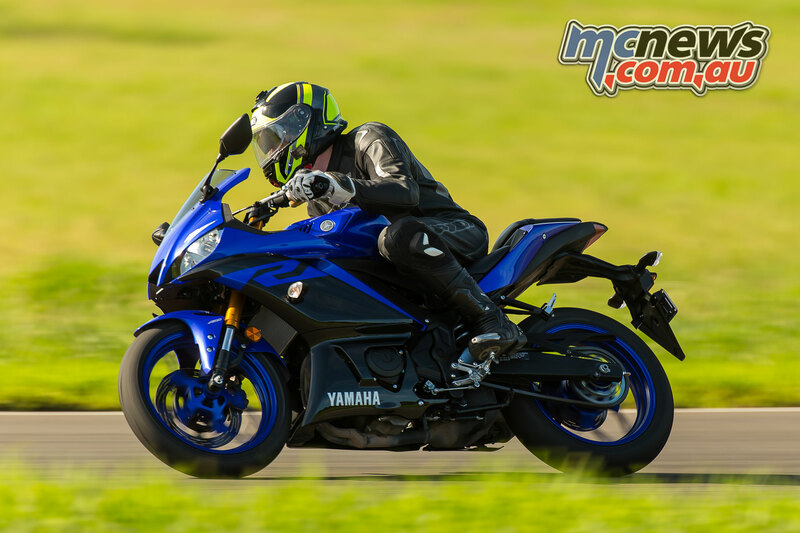 It’s easy to assume that a larger more powerful machine is best for a track day, but in reality when it comes to expanding your skills and exploring the limits of your motorcycle, something (exactly) like the Yamaha R3 is a clear winner for most riders. The revised suspension certainly helps make the R3 better than ever on the track, while lower ‘bars and more room in the racer crouch also contribute to a better track day experience, especially for larger riders. 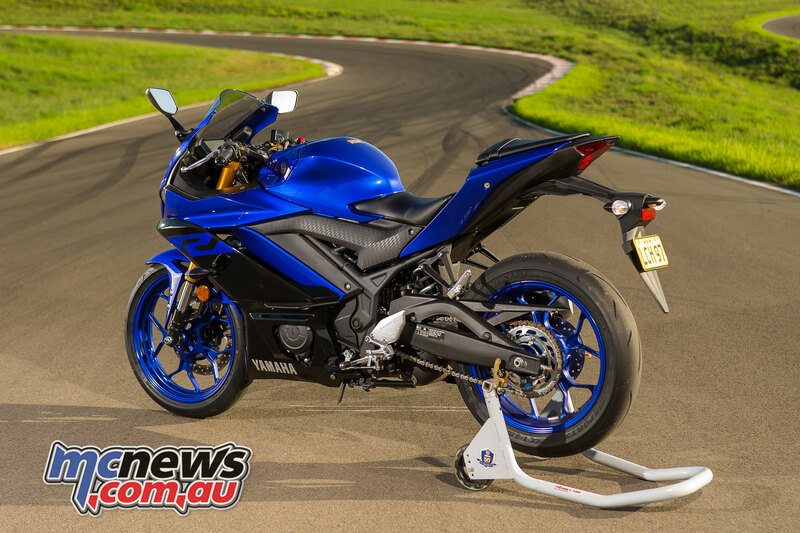 For my pace the 2019 R3 offered plentiful power for doing the rounds at the relatively short 1.4km Luddenham Raceway circuit, with great stability through the forks when on that single front brake coming up to the turns. More isn’t always better, and that relatively gentle bite makes trailing the brakes into the corner, and transitioning off the brakes, a smooth and confidence inspiring experience. For a non-adjustable front fork set-up that’s also particularly important. The rear does offer preload, but the strength of the standard system is realistically a sporty road set-up that works well enough on the track – at least if you’re somewhat near my 70kg. You can do a track day on anything, but you can feel (and look a little) like Valentino Rossi on this machine. At 180cm and 70kg I found the R3 light and nimble, with an effortless turn in on the Dunlop Alpha 14 rubber and amazing levels of grip. It was also stable enough for me to be really scraping the hero blobs in a few sections until they were removed, allowing more lean angle to be realised. That taut parallel twin is a pleasure to rev out, and if anything I’d say it left me being slightly lazy with my gear changes, however that’ll vary by track and also obviously how quick you’re going. The fact there’s no slipper clutch fitted to this machine is not much of a detriment as the clutch is light and aggressively downshifting and blipping the throttle everything remained smooth. The gearbox is also slick, while there’s adjustability in the linkage if you’ve got big feet like me and want to move the gear lever slightly. A big shoutout also goes to Damian Cudlin and MotoStars for running the day at Luddenham Raceway, as well as introducing several of his up and coming racers in the Oceania Junior Cup, YZF-R3 Cup and Supersport 300 Championships. 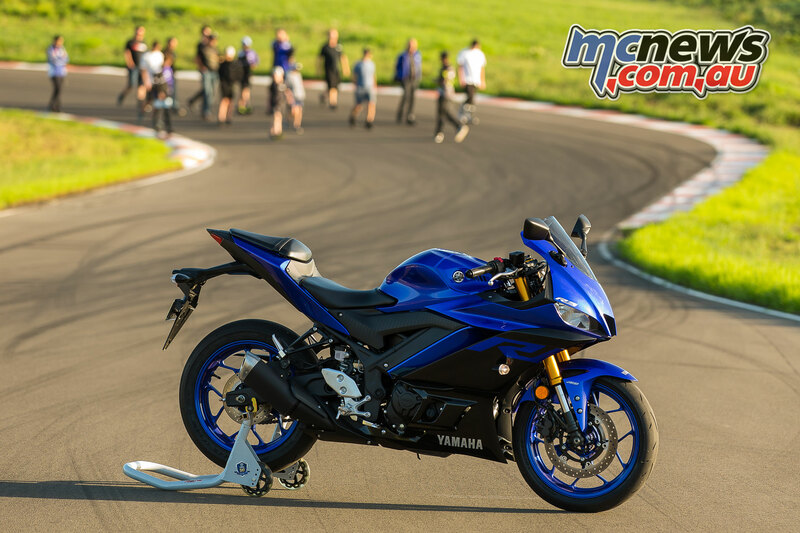 Now obviously when it comes time to upgrade to an R6 or even an R1, there’ll be significant gains to be had at the track, but as a first motorcycle the R3 makes an amazing option if you’ve got your heart set on doing track days, while also being an amazing everyday machine. 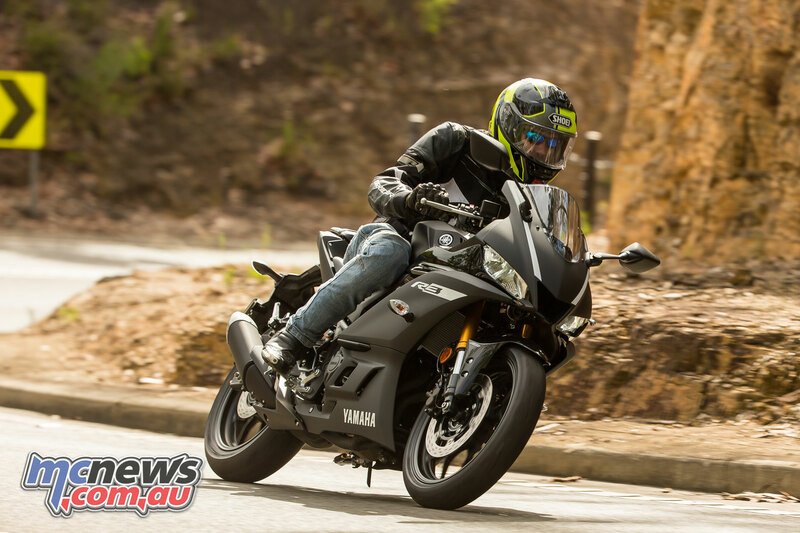 It’d be a real mistake to think of Yamaha’s 2019 YZF-R3 as ‘just’ a LAMS machine. It’s far more than that. Previous articleWSBK | Will Bautista break Rea’s Assen stranglehold?